One of the largest and most prestigious residential developments in the Middle East, the Jumeirah Golf Estate is situated in what’s known as new Dubai, a few miles from Dubai Marina and the iconic Burj Al Arab hotel. Among the high-end leisure amenities available to residents and members, are two Greg Norman–designed golf courses, Earth and Fire. The Fire Course is the more rugged of the two, while the Earth was designed as a clean-cut, championship–ready test. Opening in 2009, it has already established a level of notoriety as host of the season ending championship on the European Tour. 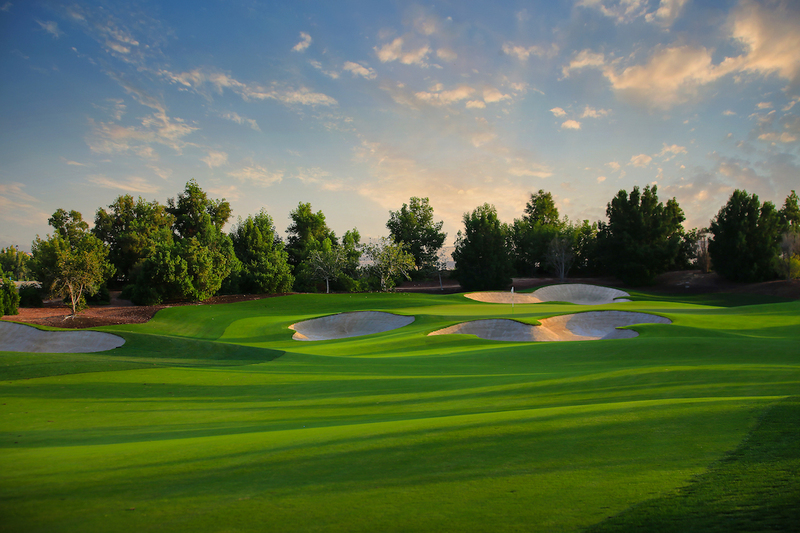 While the virgin landscape of the United Arab Emirates could hardly be described as fertile for golf, large budgets enable design companies to give their courses an almost-instant sense of maturity. 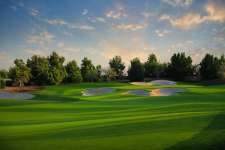 So it was at Jumeirah, where a flat desert landscape was transformed into a golfing oasis through the abundant planting of mature tree species and the complex shaping of sizeable golf corridors. These corridors are often lined by large, sand–splashed bunkers that, at times, deviate into the actual fairways to block direct passage to the green. Unsurprisingly for a modern tournament venue, the Earth Course is both extremely long and extremely difficult, especially for average amateurs. The quick, contoured green sites and deep bunkers are brutal on those playing poorly, but the holes themselves are nicely varied. The use of lakes and a meandering creek is effective, particularly on the closing stretch. While the island green at the par three 17th might not win awards for originality, it is well constructed and followed by an excellent heroic par five finisher along the creek that has already proven pivotal in a number of exciting events. Although the Middle East is mostly devoid of great golf and overly reliant on the residential development model, the Jumeirah Estate has undeniable appeal. The fact it hosts an important annual championship is sure to keep it front of mind for those visiting Dubai.